The Condé Nast Building, a 48-story office tower, is the centerpiece of the 42nd Street Master Plan prepared by the 42nd Street Development Corporation, a public/private consortium created to promote the redevelopment of this traditional heart of Manhattan. The office tower has two orientations: on the side facing Broadway it takes on the character of Times Square and its active and dynamic environment, and on the side facing 42nd Street it takes on the more sober characteristics of the mid-town Manhattan business community. 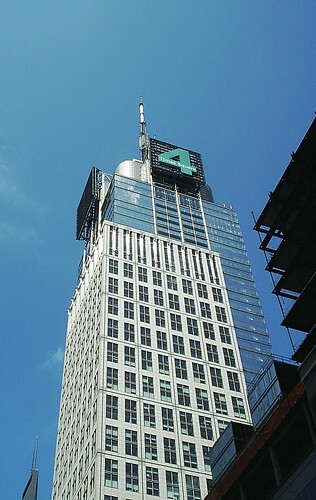 The building top reflects the principal structural support system, and it expresses in a high-technology style the project's location at the intersection of Broadway and 42nd Street-"The Crossroads of the World." In an article in the New York Times, Herbert Muschamp wrote, "The tailoring of form to context is one of the strengths of buildings designed by Fox & Fowle. That talent gets quite a workout here, in a design that tries to relate the building to the bright lights of Broadway and the masonry cliff bordering nearby Bryant Park. It excels as a piece of urban theater, with a cluster of neon signs at the base and an eruption of high technology hardware popping out of the top." The Condé Nast Building is an environmentally responsible building. 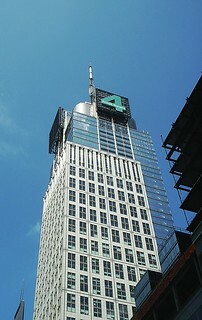 All building systems and construction technology have been evaluated for their impact on occupant health, environmental sensitivity, and energy reduction, making Four Times Square the first project of its size to adopt state-of-the-art standards for energy conservation, indoor air quality, recycling systems, and the use of sustainable manufacturing processes. The building features environmentally efficient gas-fired absorption chillers and a state of the art curtain wall with excellent shading and insulating performance. The air delivery system will provide 50% more fresh air than industry codes, and a network of recycling chutes will serve the entire building. Stringent procedures have been followed during construction as well as in the day-to-day operation of the building in order to maintain these standards. A comprehensive set of tenant guidelines has been developed as well.